It has been a popular opinion among pundits that while President Obama's job approval numbers are down, the people still like him and that will keep his job approval from going much lower. That has been the only saving grace for this president...until now. With some recent polls on the president's popularity that have come out, that can no longer be said. Now president Obama has also become personally unpopular with a majority of the American people. That is deadly to his remaining days in office. * This from The Hill: "A new survey suggests President Obama is just as unpopular as former President George W. Bush. Just over half of those polled, 51 percent, have an unfavorable view of Obama, and 51 percent currently feel the same about Bush, according to a CNN/ORC International poll released Thursday." * This from Gallup on June14, 2014 as reported on Breitbart quoting the Obama favorable ratings: "Americans' views of President Barack Obama as a person have turned slightly negative, with 47% saying they have a favorable opinion of him and 52% an unfavorable one. That net favorable rating of -5 is the least positive personal assessment of Obama to date. * This from the Wall Street Journal/NBC News poll that has just been released we get this personal favorable rating of president Barack Obama: 45% negative and 41% positive, with only 20% very favorable, vs. 31% very negative. A president with low job approval ratings this late in his presidency is bad news and signals an almost certain lame duck status for the last two years of his presidency. Those low job approval numbers have been there for a long time as a study I did in my post "What's Up With The Rasmussen Reports Polls" has denoted. In that post we show how for the last 8 months in the Real Clear Politics average of all polls, the president has been between 40 and 45% for that entire time. And in the last few days, the president has been nearer to 40% than to 45%. So, there is no doubt that for a very long time the president has had low job approval numbers. Now when you add to the president's low job approval numbers, the president's low personal favorable numbers, that is a combination that almost certainly no president can recover from. It will be no different with this president. 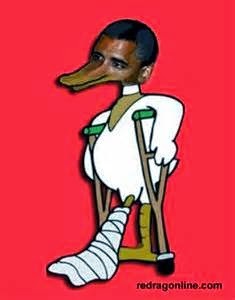 Obama has written his own entry ticket to the duck pond in his disrespect for the laws, his condescending attitude, and his naivity with regards to foreign policy---- what is shocking is the vast number of ducklings following their revered duck! Yes, Brad and that is kind of scary when you think about it!